Individuals looking to invest in physical gold have two options: coins and bars. PAMP Suisse Gold Bars are world-renowned and permitted by the IRS to be held in individual retirement accounts. PAMP stands for “Produits Artistiques Métaux Précieux,” or “artistic precious metals products” in English. Established in 1977, this Swiss company is the world’s leading bullion brand. Their services include precious metals pricing, physical trading, and daily market reports. PAMP also has clients that range from central banks and government mints to bullion retailers. Obverse: The obverse (front) side depicts the goddess Fortuna, the Roman goddess of fortune and luck. Reverse: Stamped with a unique serial number along with the weight and purity. 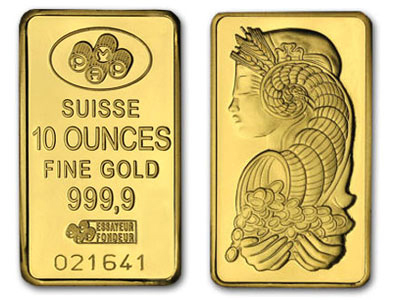 The design pictured above is the most common for PAMP Suisse Gold Bars. They are minted in other designs as well; since 2011, PAMP has been producing gold and silver bars in its “Lunar Calendar Series”, the latest in the series being the 2015 “year of the goat” edition. PAMP Suisse Gold Bars come in various shapes and sizes, and no matter the size or weight they are guaranteed to be the highest quality of pure gold – at least 99.99%. PAMP Suisse Gold Bars are permitted by the IRS for use in a self-directed IRA. Gold bullion must pass certain standards to be permissible in IRAs, which is why PAMP Suisse Gold Bars are one of the more popular products investors choose when adding gold bars to a Precious Metals IRA. Gold has also been used as a safe haven from inflation for decades. The value of paper assets can change severely, while gold’s track record has remained solid for over the past 30 years. If you have not diversified your retirement holdings beyond the stock market, it may be time to do so. For more information about adding PAMP Suisse Gold Bars to your Gold IRA, tax-free and hassle-free, call American Bullion at 1-800-326-9598 to speak with a gold specialist.